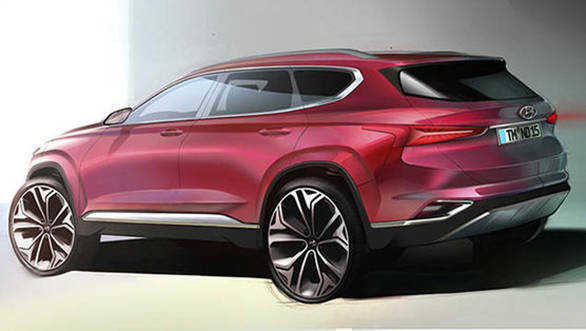 The 2019 Hyundai Santa Fe SUV has been teased again in sketches ahead of its debut at the 2018 Geneva Motor Show in March 2018. Days earlier, Hyundai had released a teaser silhouette image of the 2019 Hyundai Santa Fe. 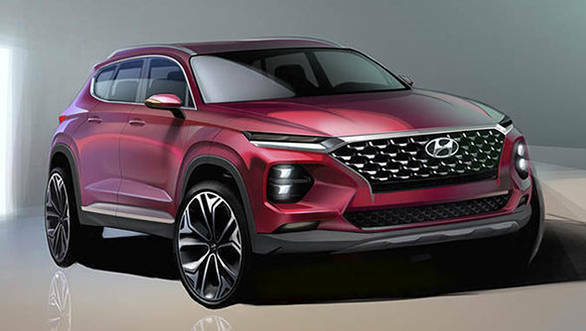 This time around, Hyundai has revealed more details of the fourth-generation SUV's design with official sketches from the front three-quarter view. The 2019 Hyundai Santa Fe now carries the distinct Fluidic Sculpture 2.0 design language with a large cascading grille dominating the front fascia. On either side are strips of LED DRLs under which are the headlamps in a separate housing. This design language is strikingly similar to the smaller India-bound Hyundai Kona compact SUV. The grille, DRLs and headlamps are all bound together by a a large chrome strip across the width of the fascia. This will be the fourth generation of the Hyundai Santa Fe and will likely be launched in international markets towards the end of the year. The sketch also reveals a subtle character line placed high on the shoulder which runs from the LED DRLs to the top corner of the taillamps. Overall, the sharp design is very distinct from iterations of the Santa Fe and if the production car retains this, it will turn out to be quite a looker.